Free Shipping on All Orders October 1 – 31, 2011! 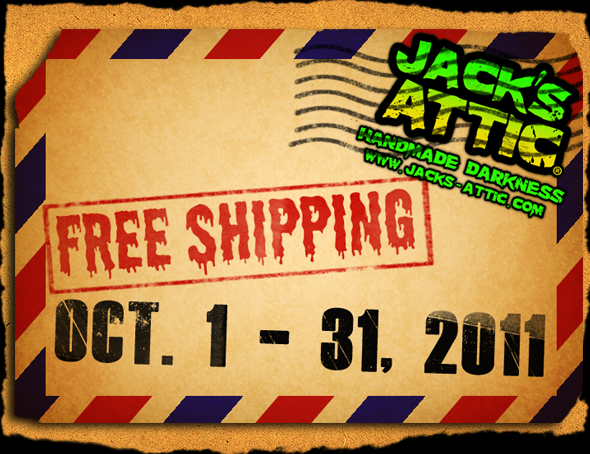 Starting today, October 1, 2011, and running through the end of the month (Halloween) Jack’s Attic is offering FREE SHIPPING on all orders. So, head over to our Artfire Studio and grab yourself a Halloween treat! You’ve got some very cool stuff here. I’ll be back! Thanks! Stay tuned. We have some new stuff coming out soon. We wanted to have it out in time for Halloween but the schedule just wouldn’t permit it.